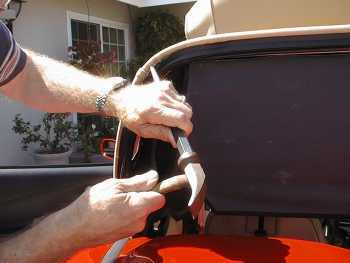 It was discovered that the seams on the convertible top were very thick and were resting on the deck painted surface and scratching the paint. The top (bow no. 5) was adjusted so that the top fabric should not rest on the paint, but have a clearance of 2-3mm (0.08" to 0.12") per the shop manual. 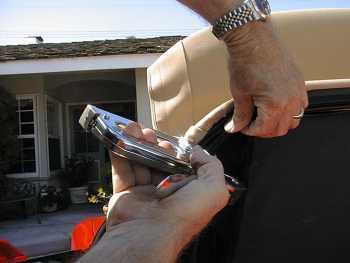 The subject was discussed with the dealer and they had not experienced this problem before but thought that by further adjusting of the top the seams might be raised off the deck. We thought that further raising of the bow off the deck would have an unsatisfactory appearance so it was decided to attack the problem directly. How could the thickness of the seam be reduced, providing clearance all around? This report is provided to assist anyone that might want to do the same modification to their 2001 C-5 or to provide information to the dealer as a guide as to how they might solve the problem. Expect the job to take about 3 hours from start to finish. The following tools were used to make the modification. One of the diamond cutters is a small disk which was used to cut the belt material and the other is a diamond covered drum used to grind away the aluminum. The convertible top on this 2001 Corvette has rather thick seams that sit directly on the painted surface of the deck. 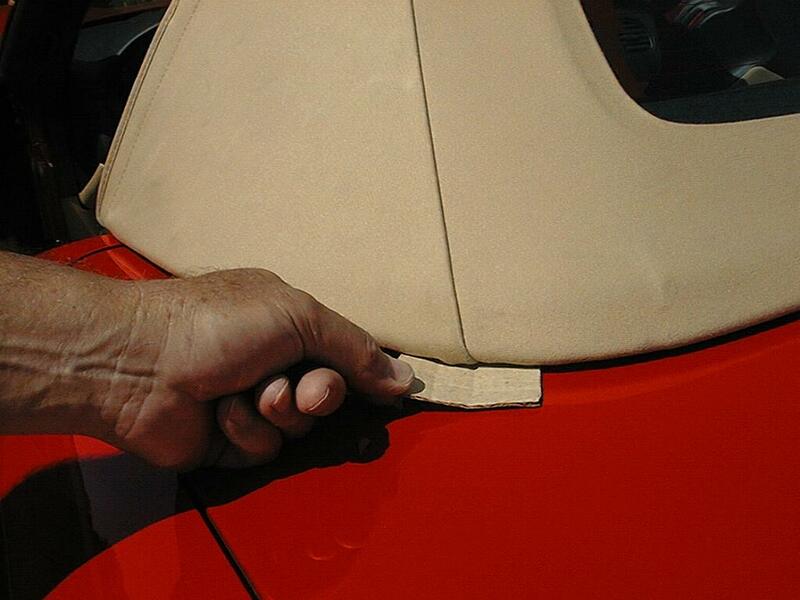 When the car is driven with the top up, movement in the top caused the seam to scratch and damage the paint. The design of the top is such that a rubber seal under the top bow rests on the black plastic molding, keeping the fabric up and off the painted surface. The first picture shows a 1/8" piece of cardboard which can be easily slipped under the top and the deck everywhere except near the seams. The next picture shows the extent of the seam thickness. There is an adjustment that allows for moving the bow up and down. It may have been possible to move the bow up another 1/8" and get the seam off the painted surface. Instead it was decided to attack the problem directly and find out why the seam was so thick and if necessary alter the bow with an indentation to keep the seam up and off the paint. 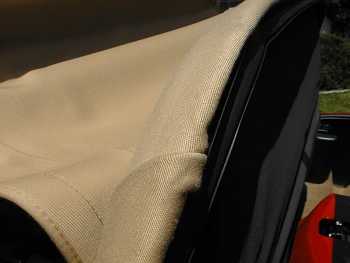 The top fabric is stapled over a plastic strip that is mounted to the aluminum bow. The staples are under the rubber seal. The staples are revealed in this photo. 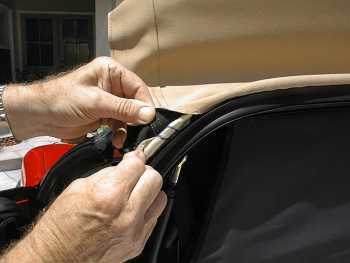 The rubber seal is held back to reveal the staples. The staples at the seam and three either side of the seam were removed and the area inspected. 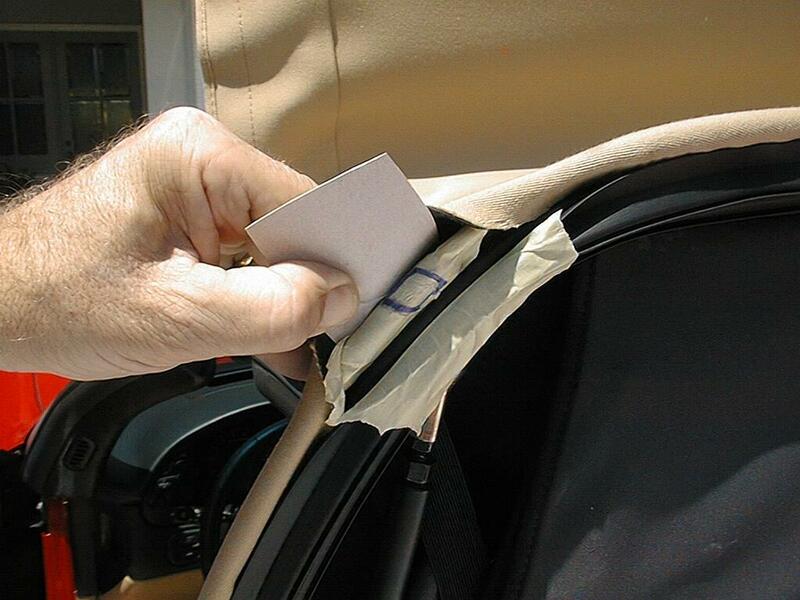 It was discovered that a length of seat-belt like material runs over the bow and is stapled to the plastic strip. 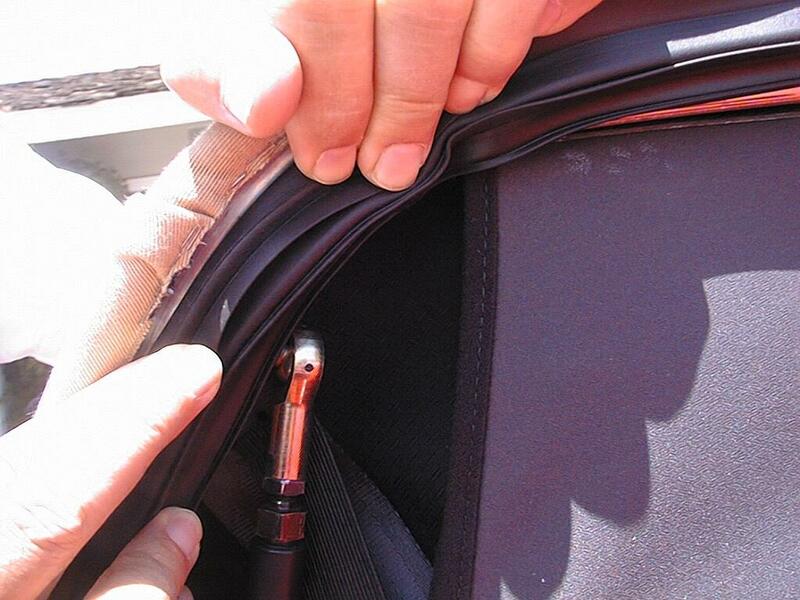 This seat-belt material is attached to the new inner liner and is anchored at the same place as the top. This further increases the thickness of the material under the bow at the seam. It was decided that it would be necessary to remove the seatbelt material right under the seam also. 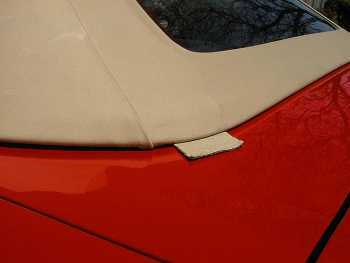 A piece of tape is placed over the bow. The seam was positioned carefully over the tape. The tape was then marked showing the area to have material removed. The rubber seal was held out of the way by taping and, for protection a cardboard shield was made and slipped behind the area where the cutting and grinding was to take place. The plan was to cut out the belt area and grind an indentation in the bow for the seam to rest down into. This picture shows the tape removed revealing the area with belt material cut out and the recessed area widened. 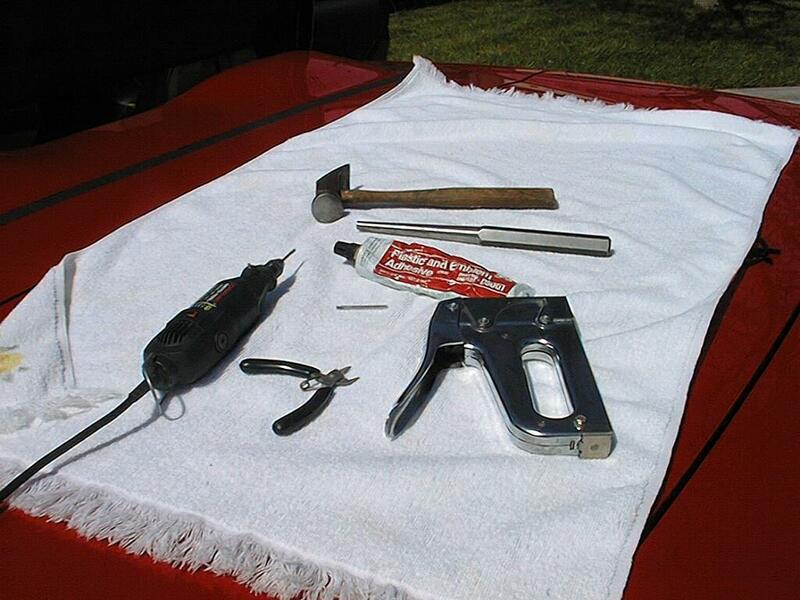 The cutting was done with a small diamond-cutting wheel in the Dremel. Once we cut through the belt, we found that the manufacture had made an indentation in the bow for the seam material, but the top was misaligned by half the width of the seam. We used another diamond grinding tool and widen the indentation in the bow so that the seam would rest squarely in the indentation. 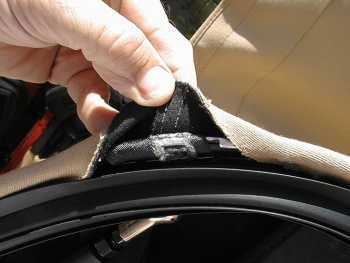 The belt edges and the indentation area was coated with adhesive to prevent the belt from unraveling and to help hold the seam completely down into the indentation after stapling. The top was stapled in place with Arrow T-50 ¼" long staples. Longer staples, T-50 3/8" were used when stapling through the seam. The end of each staple was set with a flat punch and a hammer so that the head of the staple was level or below the level of the material. The tape was removed from the rubber seal and the rubber seal returned to its normal position covering the staples. The top was placed in its normal up position. After the modification, the 1/8" piece of cardboard slipped under the seam as easily as it slipped under any other area between the bow and the deck. Clearly, no fabric now touches the deck paint. Any motion of the top and the deck will now happen between the rubber seal and the black plastic molding. It was determined that the top adjustment would not be changed but left with the1/8" clearance. The top was left in the up position for a day with four layers of cardboard under the seam while the glue dried. Caution: It is very important to not let any material from a grinder land on glass, plastic or painted surfaces. The hot material will permanently mark the surface. Cover everything with towels or blankets. We covered the entire deck with a blanket and the convertible top with towels. This Corvette is one month old with 1000 miles on it. The top was up for one freeway trip of 600 miles. The scratches from the seams are deep and permanent. The paint has not worn through to the undercoating, but the scratches are too deep to rub out. If anyone has any questions, feel free to contact Ernie Jenson at erniejenson@peoplepc.com or post to the thread below. To discuss this subject, please click here. Copyright © 2000-2017 C5Forum.com. All Rights Reserved.